CEREC® is comprised of several computer-assisted design (CAD) tools and a milling machine that creates custom ceramic restorative devices. CEREC® can benefit almost anyone needing a ceramic restoration. This is of great benefit to nervous patients, and it can also reduce the cost of treatment. How can CEREC® benefit me? CEREC® can benefit almost anyone needing a ceramic restoration. Exceptions include patients who have a prior history of breaking ceramic devices and those with a deep bite. CEREC® devices are proven to last for over 5 years, but recent research indicates that most CEREC®-created restorations last for more than 10 years. The CEREC® System is sometimes called a CAD-CAM system. CAD-CAM means Computer Assisted Design and Computer Assisted Milling. 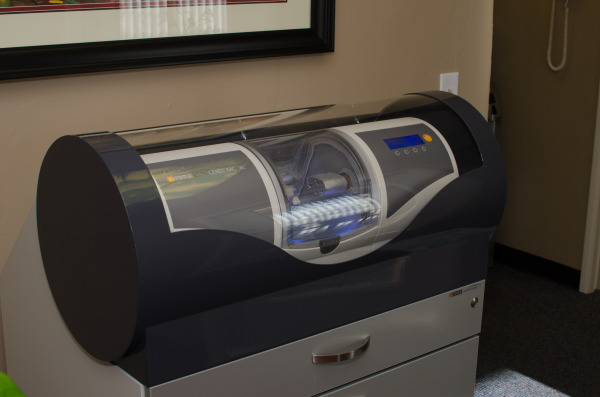 The CEREC® system has three major components: Acquisition device: This device is home to a high-quality camera and a medical grade computer. The function of this unit is to photograph the prepared tooth. Three-dimensional images are created of the tooth on the screen, which the dentist uses to design the perfect ceramic restoration. The first step in the procedure is preparing the tooth for the restoration. The dentist will then take photos of your affected teeth using the CEREC® Omnicam, sending a three-dimensional, colored model to the CEREC® machine. These images are transposed onto the computer screen, where the dentist will view the tooth from every angle and design the final restoration. When the design is complete, it will be transmitted to the milling unit. The dentist will insert a block of ceramic, matching your tooth color, into the milling machine which will then create the full crown, onlay, inlay, or veneer. Before affixing the restoration to the tooth, the dentist will perform a dry fit to ensure comfort. Once a perfect fit is established, the restoration will be polished and affixed to the tooth with dental cement.